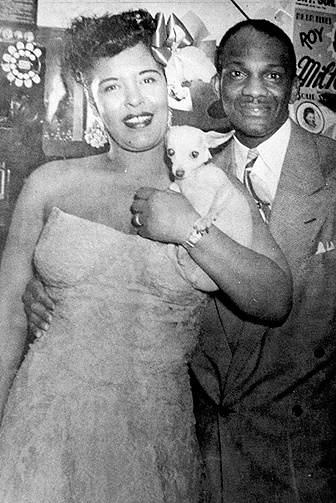 Renowned jazz vocalist Billie Holiday with Wesley Johnson Sr., at his Club Flamingo in the mid-1950s. Prior to World War II, modern jazz in the swing and bebop forms was thriving nearby in the Central Avenue area of Los Angeles, but San Francisco was still largely preoccupied with traditional jazz, often known as Dixieland. During the late 1940s, however, a few brave, new clubs opened up in the Tenderloin and North Beach neighborhoods, offering up the bebop sound to San Franciscans. They took to it voraciously. By the mid-1950s, a plethora of jazz clubs dotted the San Francisco neighborhoods. Jimbo's Bop City closed its doors in 1965, just when the Fillmore entered a period of drastic physical change. Over the years, much of the neighborhood had fallen into disrepair, and the San Francisco Redevelopment Agency selected it as an area in need of urban renewal. In reparation to the Japanese population that had been displaced during World War II, a new Japantown was built in the Fillmore. This construction resulted in the closing of most businesses that had occupied the old buildings and the dispersal of the families who had dwelt there. Tourists today will find an enormous multiplex theater, apartment complexes, hotels, and numerous Japanese restaurants dominating the area, with a bank at the spot where Bop City once stood. Buchanan Street has been closed to vehicular traffic, and there is no such address as 1690 Post Street. Even the building is gone. And so it rested, until one day, deep in the dusty archives of the San Francisco Redevelopment Agency, I discovered a photograph of the Bop City building, at that time empty, taken at the end of 1969, five years after the club had closed. The photograph documented the sale of the building. With a bit more research, I learned that a few of the better-preserved Victorians had been saved and moved to other locations. The agency's records didn't show specifically which buildings had been saved, nor specifically where they'd been moved. But they did indicate to which blocks these buildings had been relocated."' So, photograph in hand, I went exploring those blocks of rescued Victorians. About six or seven houses into my search, there it was! Detail for detail, the house matched the one in the Bop City photograph! In the early 1970s, the building had been moved around the corner from Post onto Fillmore Street. Now painted bright purple with white trim, the add-on in front that formerly housed the waffle shop is gone, and the room that had housed Bop City now contains an African-American bookstore. Thanks to Carol, and the California Historical Society for permission to excerpt this article.